EMMANDUS INSPIRATIONAL NETWORK! : WHAT TO DO WITH THE PROVERBIAL BOX? WHAT TO DO WITH THE PROVERBIAL BOX? 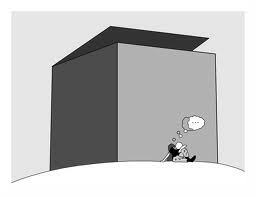 The subject of our discussion,-the box; the nature of the box; thinking outside the box has lingered on for a while, and it is high time we finally did something about the box. • What if there is NO BOX??? Walk out of the box: If the box were a place of limitation, devoid of new ways of doing things, If it were a place of die-hard-no- tweaking conventions devoid of the need for innovation or the allure of creativity, then the best and principal action might be to just walk out of the box, and step unto a new plateau of reality where you can see the new horizon. Sit on the box: I had this on my mind a while ago that what if you could actually sit on the box and use it as a seat of reflection? Or what if you could actually stand on the imaginary box that limits you to the conventions, and then use it as leverage. That will really be a fun thing to do. Anyways, If I could I will seat on the box or stand on the box. Use the box: Rather than being tied to the box, we could actually use the box in different ways that help us deliver a solution in the most creative or innovative ways, Christmas season is actually long gone, but I figure it might not be too late after all to give out a new year gift to friends, some old folks or anyone we care to send a box full of gifts. Sell the box: What then if this box were redesigned and worked into a great piece with some value to it, then it could actually be put up for sale at a price to any buyer who could find much use for it in its newest form. So I might as well sell the box! What If there was no box After all? : Yes, we all have heard about ‘thinking outside the box and we have both explored the nature of the box in the past few weeks, but what if there was no box at all, what if the proverbial box had actually never existed? What if the box only existed in our thoughts and imaginations? Then the action point would be to destroy the box and every other thing that holds us back from reaching out for the greatness that we are capable of! The proverbial box therefore, could mean many things to many people. No matter what, you can always do something with the box, you could walk out of the box, sit on it , destroy it ,redesign it or sell it off in its best form.